Kerala is located in the southernmost tip of the Indian subcontinent touching the breeze of Arabian sea. Popularly known as “God’s Own Country” , this name has a mythology behind. It is believed that lord Parasurama (incarnation of lord Vishnu) has thrown his axe from one side of the arabian sea to build a new land for his devotees to reside permanently and fortunately it struck in a suitable spot to form the state. May be because the land is god’s creation, Kerala is blessed with lot of traditions and customs which have spread its fame throughout the world. People from across the seas are reaching the state to learn the culture they have never ever seen before. The state is also blessed with numerous festivals throughout the year. One of the most prominent festival is Vishu, a day which sets the fortune for the rest of the year. 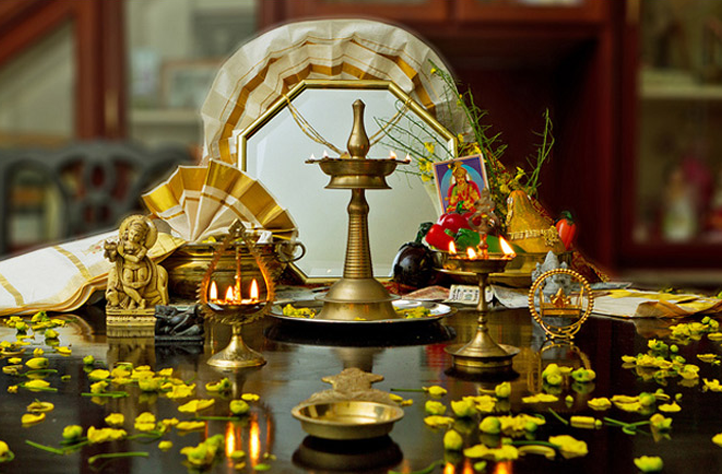 Vishu is observed during the malayalam month of medam, which usually comes in March or April every year. Keralites consider this day a promising one as it decides the fate of Malayalees in the astrological new year according to beliefs. It starts with after the kani is seen in early morning. 14th of April is the date on which the festival falls in 2017, which is of great significance for the people of Kerala situated in different part of the world. The auspicious day starts with the Kani Kanal which means the “first sight” is the most important incident that should happen because it is based on the view, prosperity for the new year lies. The evening before vishu, the members in a house prepares the necessary items to get the kani ready to be seen the following day. Things that make up the preparations includes idol of god, kanikonna (a flower of golden rain tree ), a pot, coconut, gold ornaments, money, new cloth etc. Garlanded idol of lord Sree Krishna is kept in the middle which should be the first sight of a malayalee. Lighted lamps and konna is kept surrounding the divine deities statue. The elders of the house sees it first, followed by the youngsters to the spot after closing their eyes to make sure they don’t see anything other than what they ought to see. Elders offer giftings which is known as Vishukaineetam to others in the family and shower their blessings on them. In famous temple like Guruvayoor, Sabarimala and Ambalapuzha, Vishukani is of good importance and people from across India reach the shrines to receive the luck and blessings from the almighty. Special pujas are also held on these days. Guruvayur is a popular Sri Krishna temple in Thrissur district which is the main abode of the deity. Early hours of 14 th April between 2.30 am and 3.30 am is the perfect time according to the calculations conducted by the experts in the field. People from within and the neighbouring states would be rushing towards the site well in prior, predicting the rush so that they can get prepared for the auspicious affair on the previous day itself. Authorities of Guruvayur devaswom also anticipates the same and sets everything right for the devotees comfort. By evening, new year fair will be conducted which is commonly known as Vishu vela in colloquial language. People spends time with their family in this place, where a spread of merry can be seen in everyone’s face. Stage programmes and musics will fill the mentality of the the millions present all over Kerala and abroad. Visiting the temples is another holy action that can be seen in common during the festive season. With all this the day ends and prosperity prevails in the lives of malayalees till the year end. Wishing Everyone a Happy and Prosperous Vishu and May the Joy and Happiness Fills Your Family Throughout The Year.